During the 2018 Veterans Week ceremonies, Keith Glindemann, director of Veterans Services and president of SALUTE honors society, presents a check to endow an annual scholarship for members of the organization. This story appeared in the Winter 2018-19 edition of Affinity Magazine. Click here to check out the complete magazine. 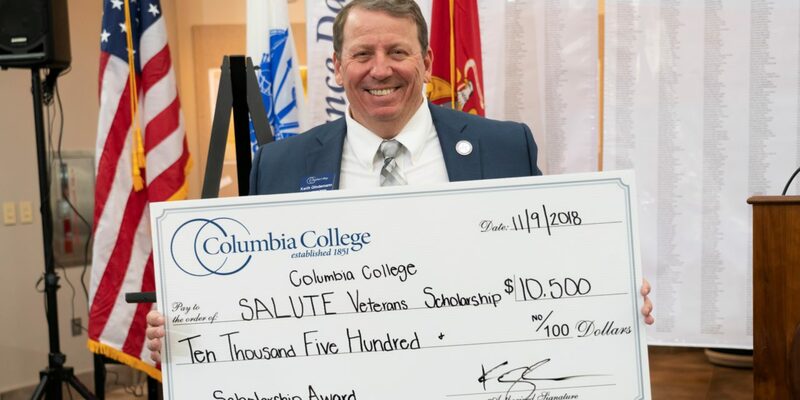 The first thing people at Columbia College will tell you about Keith Glindemann ’15 is that the school’s student-veterans couldn’t have a better man in their corner. Glindemann served in the United States Army for 24 years and received the Bronze Star for actions in combat during Operation Iraqi Freedom. He joined the Columbia College Veteran Services office in 2010 and was named director in 2015, the same year he earned a master’s degree in Business Administration. As director of Veterans Services, Glindemann does everything in his power to address the needs of service members and their dependents in their transition from soldier to student. 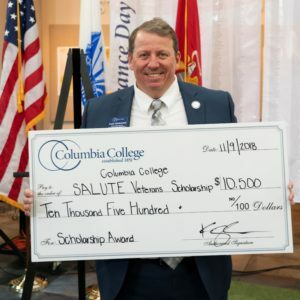 His reach extends all the way to Washington, D.C.
As a past and current president of the National Association of Veterans’ Program Administrators (NAVPA), he brings attention not just to Columbia College, but advocates on behalf of student-veterans nationwide. Glindemann has testified before Congress and provided written testimony on veterans’ educational benefits. He is also charged with maintaining a relationship with the U.S. House of Representatives Veterans Affairs Committee, the Senate Veterans Affairs Committee, the Department of Veterans Affairs Central Office and numerous other veterans services provider organizations. Back in Columbia, Glindemann serves as president of the college’s SALUTE honors society, the first such national organization for student veterans. In 2009, Columbia College was one of 10 charter institutions nationwide to launch a SALUTE chapter. Now with approximately 300 chapters at colleges and universities across the country, Columbia College is once again leading the pack with Glindemann at the helm. 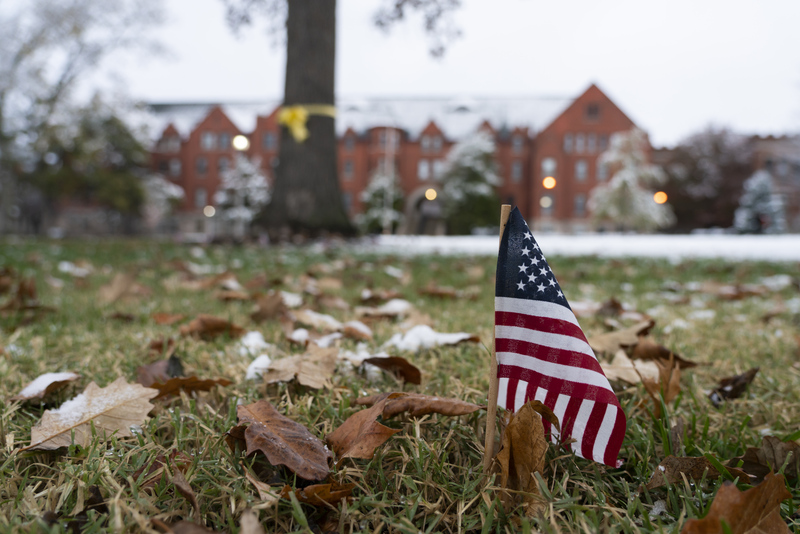 Columbia College staff members lined the paths of main campus with more than 1,000 American flags to kickoff the college’s Veterans Week activites that were held Nov. 5-9. Read more about Veterans Week 2018 here. 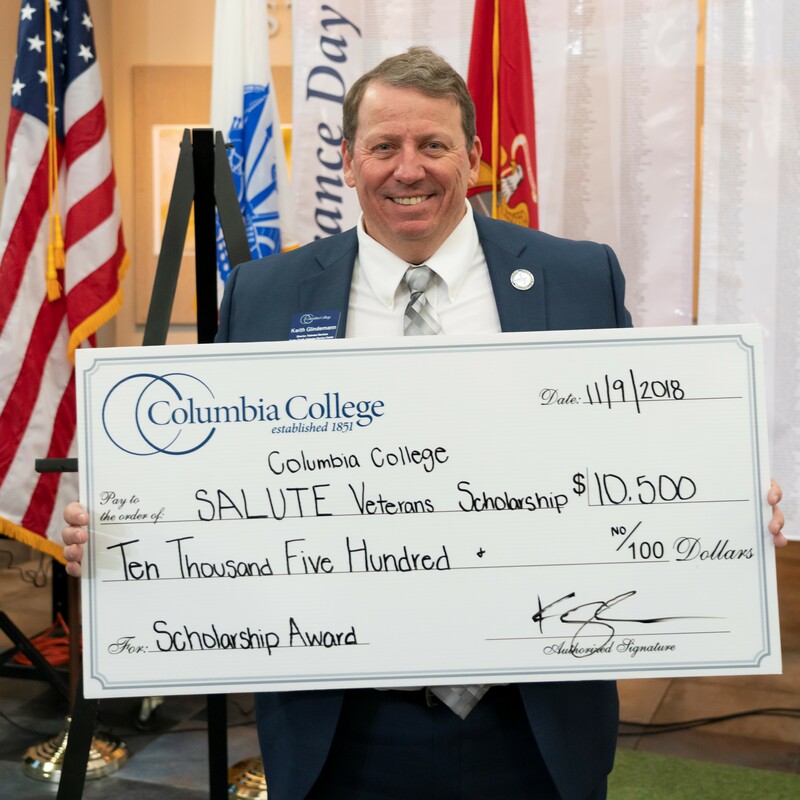 As part of the 2018 Veterans Week festivities, Columbia College President Dr. Scott Dalrymple signed an endowment agreement to make Columbia College the first SALUTE chapter nationwide to endow a scholarship for an honoree each year. It’s a fitting accomplishment for the chapter, which began with 52 honorees in its first induction class, and now boasts more than 2,000 members – among the largest of any chapter in the country. “We’re trying to continue to make our chapter an outstanding one to be a part of, and I’m really proud that it has been able to raise enough funds over the last several years so that we could be the first SALUTE chapter in the nation to offer a chapter scholarship,” Glindemann says. In addition, eligibility for induction into SALUTE – the name stands for the organization’s core values of Service, Academics, Leadership, Unity, Tribute and Excellence – will now be extended to students with sophomore status, to join previously eligible junior, senior and graduate student veterans. Upon graduation, SALUTE members wear red, white and blue honor cords over their gowns at commencement. For more information about SALUTE, visit ccis.edu/salute. To donate to the SALUTE chapter scholarship, please visit my.ccis.edu/givenow.